After completing my journey over the Sierras via California State Route 4 over Ebbetts Pass and CA 89 over Monitor Pass I turned south on US Route 395 in Mono County. My goal was to cross back over the Sierras via Sonora Pass on CA 108. Pulling off of US 395 southbound there is a BGS indicating if Sonora Pass is open. CA 108 over Sonora Pass traverses westward over the crest of the Sierras to CA 49 in the City of Sonora. From US 395 the routing of CA 108 follows the West Walker River through a valley where Marine Corps Mountain Warfare Training Center is located. Traffic is warned almost immediately about the 26% grade climb ahead to the west which is the steepest of any State Highway in California. 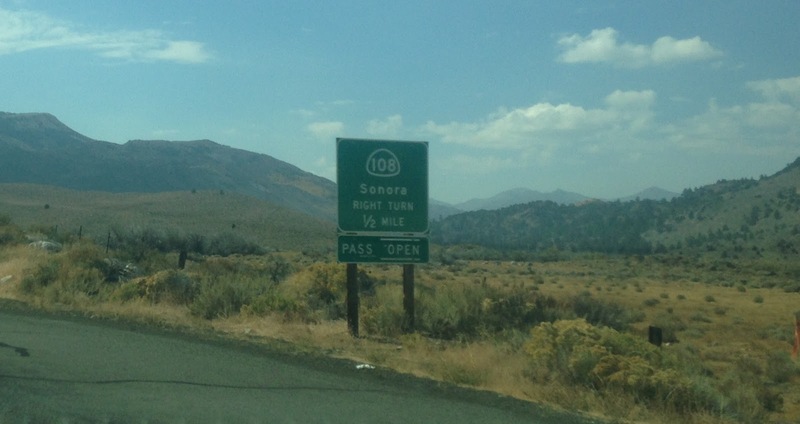 From US 395 the ascent to Sonora Pass on CA 108 is approximately 15 miles. While I didn't capture the 26% grade sign I did capture the actual road grade. CA 108 ascends through a couple switchbacks and the grade starts to lessen approaching Sonora Pass. Personally I thought the 26% grade only lasted a short distance whereas it felt more sustained on CA 4 on Pacific Grade Summit and Ebbetts Pass. CA 108 crests at Sonora Pass which is located at the Tuolumne County line at 9,624 feet above sea level. 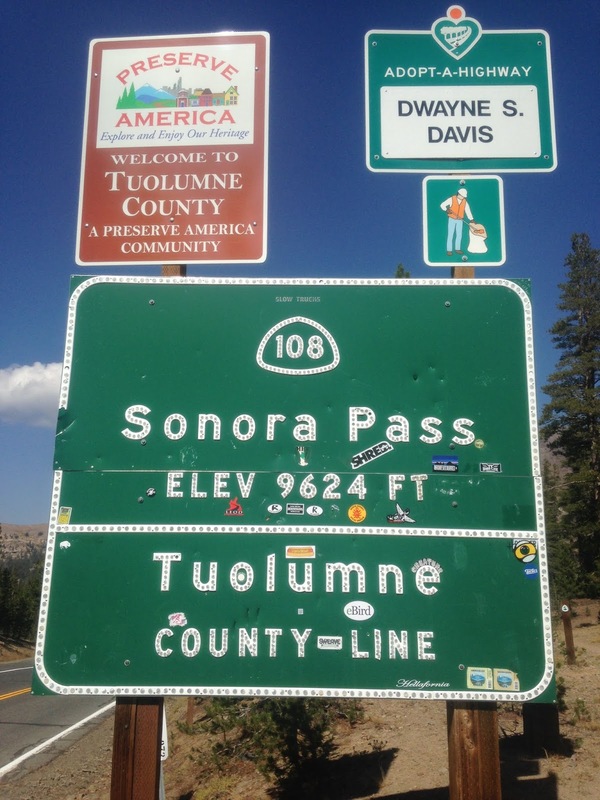 Sonora Pass has several historical placards. The first documented crossing of Sonora Pass was in October of 1841 which apparently slightly north of the modern highway. The first attempted wagon crossing of Sonora Pass was in 1852 the hazards of the roads of the route were documented by Grizzly Adams later in 1854. A pack animal route was laid out in 1862 on nearby St. Mary Pass which crossed the Sierras at 10,040 feet above sea level. By 1863 the present Sonora Pass alignment which CA 108 later adopted was surveyed and a toll road opened in 1865. While not quite as pretty of a vista compared to Ebbetts Pass there is still plenty worth seeing looking east from Sonora Pass. Unlike most passes in the Sierras the western descent from Sonora Pass is almost just as difficult and steep on average as the eastern ascent. While I certainly didn't encounter 26% grades there was plenty in excess of 10%. CA 108 follows Deadman Creek initially descending from Sonora Pass. From Sonora Pass the 1933 Dardanelle Bridge is approximately 14 miles away. There was plenty of flowers blooming in the late fall season along CA 108. Before Deadman Creek empties into the Middle Fork Stanislaus River there is a large switchback which provides a unobstructed view of Sonora Pass to the east and the road ahead to west to Sonora. CA 108 levels out at the Middle Fork Stanislaus River. As CA 108 crosses the Middle Fork Stanislaus River there is a vista point and a walking path over the 1933 Dardanelle Bridge. Dardanelle lies an elevation of about 5,800 feet above sea level. Approximately 6 miles west of the Dardanelle Bridge is the Donnell Lake Vista which has a completely unobstructed view of Sonora Pass looking back to the east. The view of Donnell Lake is pretty nice as well looking westward on the Middle Fork Stanislaus River. Donnell Lake is impounded by the 317 foot arch concrete Donnell Dam. The Donnell Dam was completed back in 1959. From Donnell Vista it is about another 45 miles westward to CA 49 in Sonora. The routing of CA 108 gradually opens up into an expressway which at the time was littered with construction. Given that I had just crossed three of the steepest passes in the Sierras I wasn't really feeling up to taking pictures of construction zones. Interestingly according to CAhighways.org there was a proposal in the 1960s to build a freeway over Sonora Pass which would have included a 7 mile long tunnel. According to CAhighways.org CA 108 was part of Legislative Route Number 13. LRN 13 was adopted from Long Barn northeast of Sonora over Sonora Pass to Bridgeport in 1901 as a state highway. Said alignment of LRN 13 from Long Barn east to Bridgeport can be seen on the 1918 State Highway Map. There's a Map on My Lap!